This map is, essentially, the start of a reboot of one of my scenarios entitled Where Hearts Were Entertaining June. The gist of the scenario is that in 1589 the English Armada is markedly more successful than in our own world, hitting the new Iberian Union hard enough to force the government in Madrid to offer peace terms to the English that left the Kingdom of England much better off: in exchange for accepting Spanish dominion over Portugal, the English would receive control over the former Portuguese colony of Brazil, with its growing population and large income. Thus sets off the journey into a world far different than our own. One of the English in South America, the Portuguese in the North, of a world power Sweden and republican Poland and an entire adventure to look at what might have been. 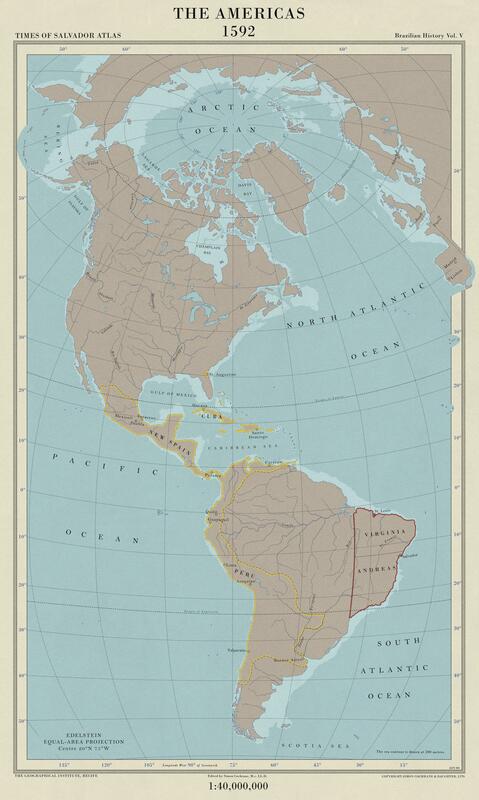 I hope in time everyone will enjoy it and for now enjoy this preview of the world, with the situation in 1592. Shortly after taking control, England reaffirmed the capital of Brazil as Salvador, sending new governors and officials who began to reorganize the territory, including renaming the two provinces. While a small change, it would be the start of a radically different future that would see Brazil become a major world leader in just about every field. I will be using this map in the future essentially as a base to show changes throughout the timeline as they occur, so expect more to come and I hope you all will enjoy.